I've always loved candy conversation hearts. As soon I saw them in the store, I grabbed a bag (and ate them all). Then I picked up another bag and vowed to slow down the eating and instead use them for a super fun learning activity for my boys. Since we love discovery bottles, I thought we'd use the hearts to make a really easy Valentine themed bottle. They loved it and as a bonus, the candy is still perfectly edible when you're done! 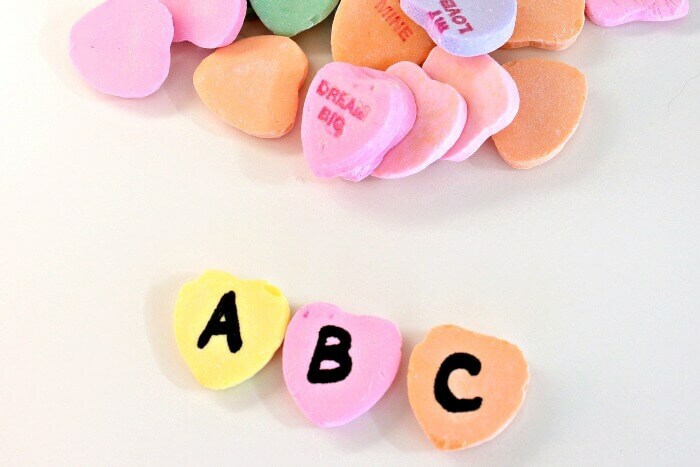 First, use your food marker to write a large letter, A-Z, on the back of 26 hearts. Once you have the entire alphabet done, put them in your bottle. 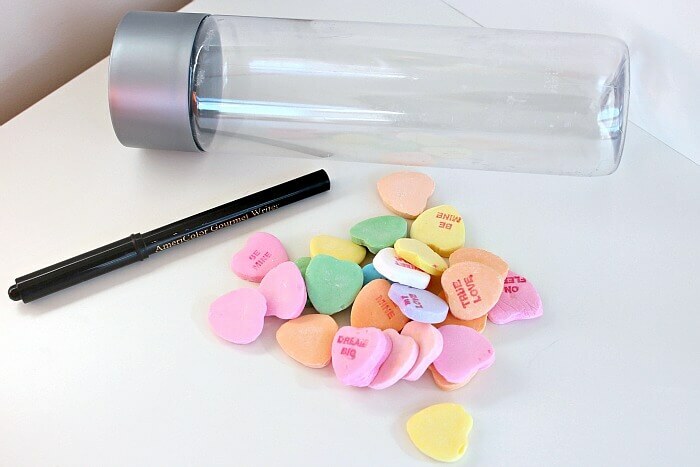 Then add blank hearts until the bottle is approximately 3/4 full (you want room for the hearts to move around). Close the top securely (glue it if you have concerns about very small children and choking). Then invite your children to check it out and see if they can spot the letters! My boys loved rolling the bottle around and looking for the big letters. I encouraged them to look for things like the letters of their names and letters we could see around the room. Then, we decided to try a little Valentine themed word hunt. 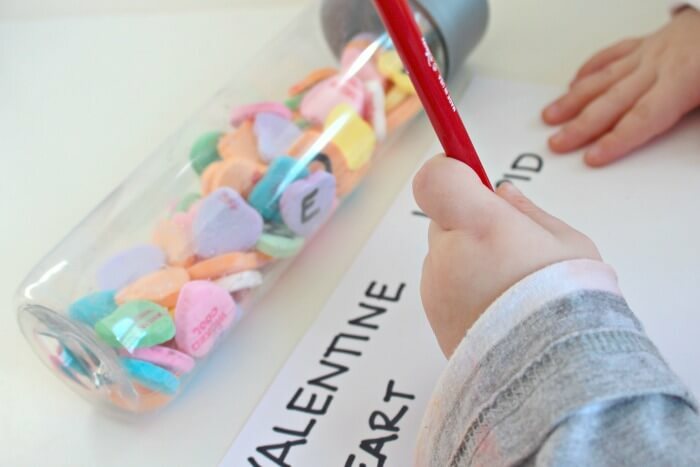 I wrote out a few Valentine words on a card and had them look for each letter in the bottle. Then they practiced tracing each letter as they found it. 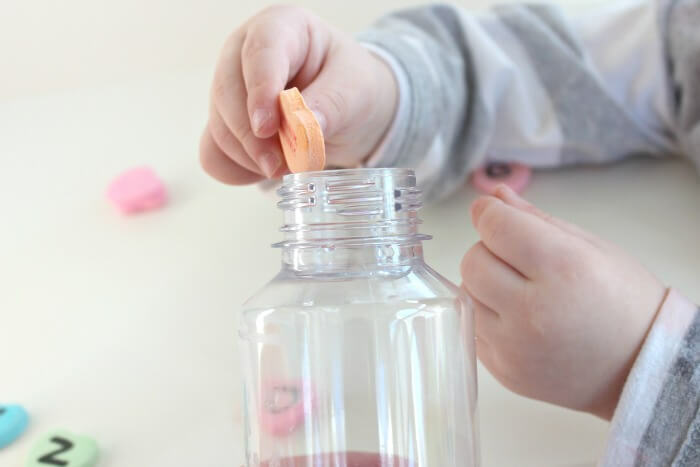 There are so many variations of learning activities that you can do with this bottle - we'll be using it a lot over the next few weeks! 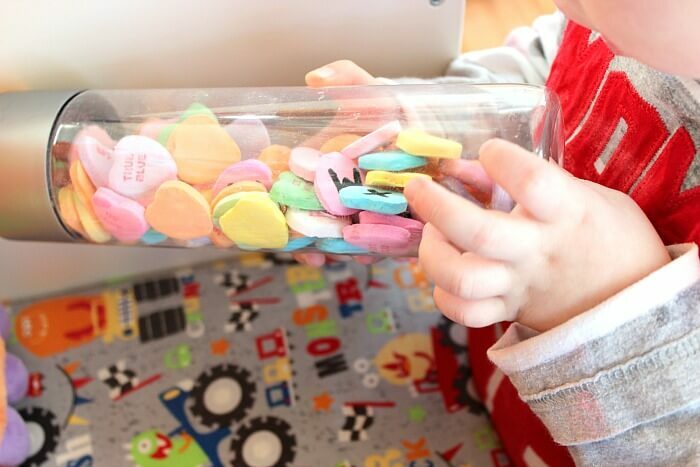 And, when you use the edible marker, the candy is still perfectly fine to eat, so this could also make a super cute Valentine's gift idea too. and find even more awesome Discovery Bottle ideas here. 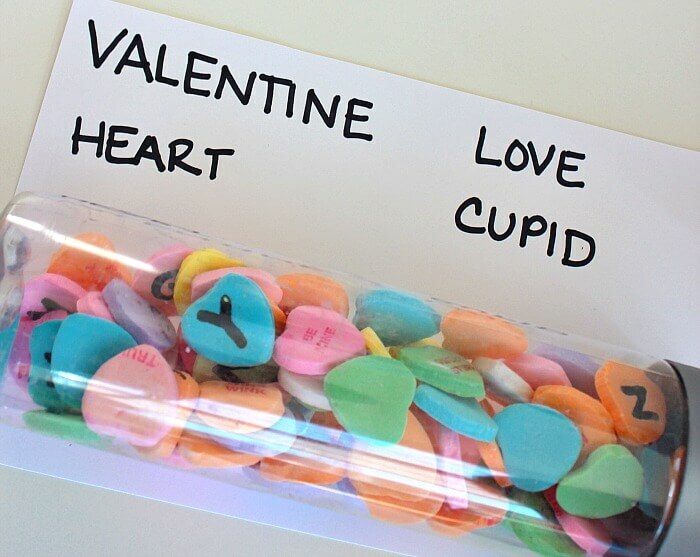 I love that you wrote on the hearts!!! Such a great idea! My preschooler will love this! 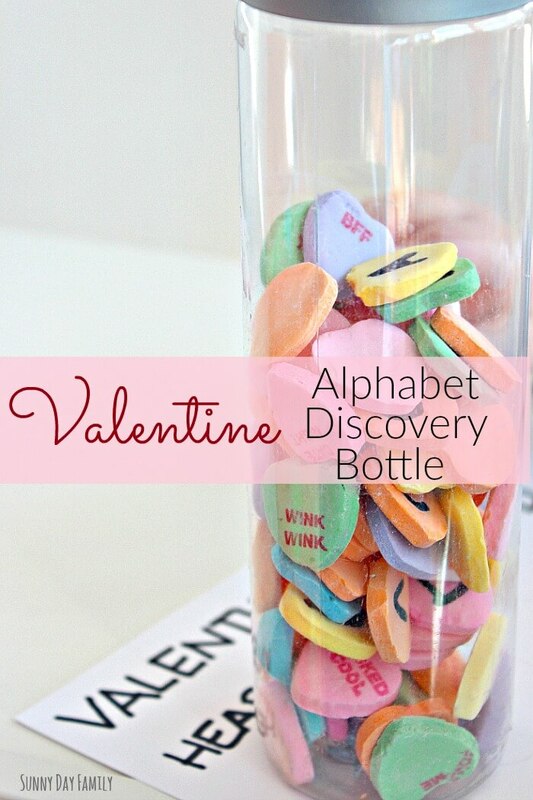 What a fun idea for a discovery bottle! 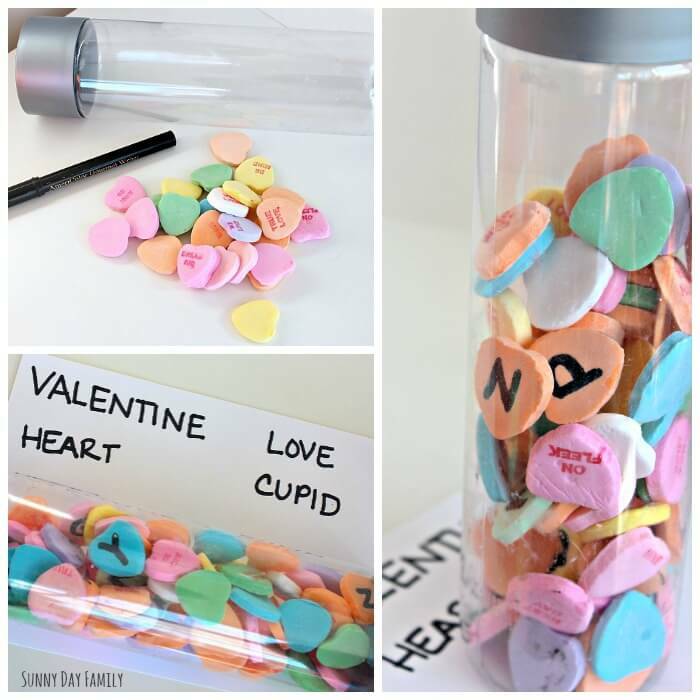 I love the idea of writing letters on the back of conversation hearts... fun!